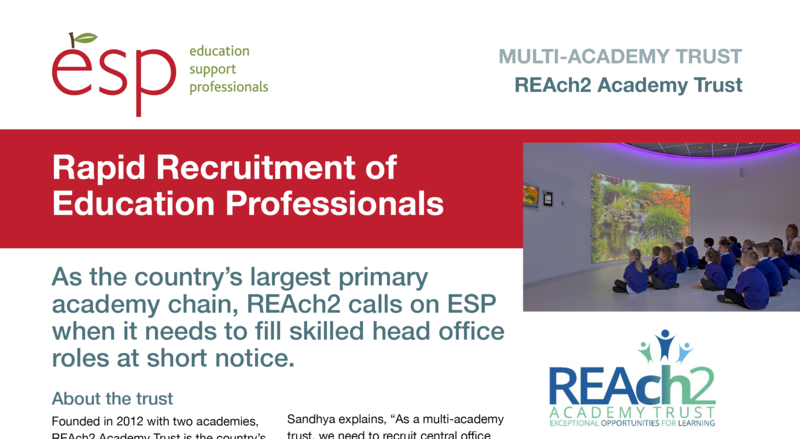 As the country’s largest primary academy chain, REAch2 calls on ESP when it needs to fill skilled head office roles at short notice. Founded in 2012 with two academies, REAch2 Academy Trust is the country’s largest primary-only academy trust. Now with 56 academies, the trust’s guiding principles remain focussed on helping struggling schools to offer outstanding education to pupils from disadvantaged or deprived communities. As a charitable organisation, the trust’s considered and responsible growth focusses on developing self-supporting families of schools, supported by the main office in Burton upon Trent. With 56 academies and a central office, REAch2 recruits over 800 new staff every year. As HR Officer, Sandhya Aurokium, and the HR team, supports this recruitment as well as being responsible for recruiting all central staff. Sandhya explains, “As a multi-academy trust, we need to recruit central office staff with education experience and sometimes at very short notice. As a charity, it is important we work with companies that offer value for money and some recruitment agencies don’t appreciate this and are too expensive for us. Sandhya continues, “Just before Christmas, we needed a temporary contracts administrator at short notice. We had a backlog of contracts and we wanted someone to start as soon as possible. During the Christmas period, we were finding difficult to find someone with education experience. I spoke to Carly at ESP and she quickly found us the perfect candidate who started in January. “I have used ESP to recruit three roles, one permanent, one fixed term and one temporary and each time, they have found us the right person. Carly takes time to understand what we are looking for and, post recruitment, checks to make sure everything is going smoothly. “When I need an education specialist, I go straight to ESP. Carly has a great approach, nothing is too big or small for her. ESP understands we are a charity and works with us to offer real value for money. They are always helpful and work hard to find us a solution.